While Dropbox gets most of the press when it comes to cloud drive services, Google Drive is a strong competitor. 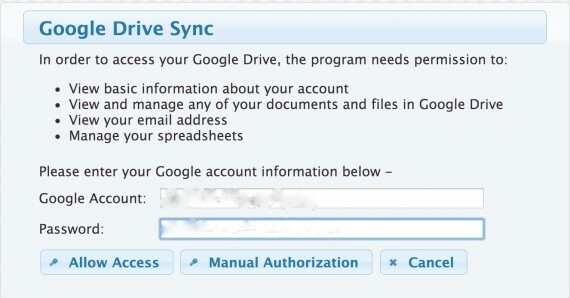 Because of the Google Docs integration, I actually use my G-Drive account more than my Dropbox. 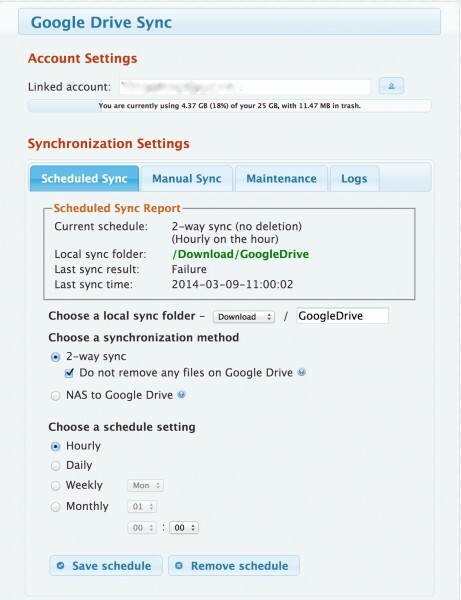 As one of the available QTS apps, your QNAP can act as a fully synced backup site for your Google Drive data. Let me show you how to do that. Since this is an optional app, you have to install it first. First boot up QTS. You can do this by entering the QNAP’s IP address followed by :8080. If you don’t want to do that, make sure you have the QFinder desktop app installed, select your QNAP from the list, and click on connect. It’ll take you there in a much easier fashion. Enter your username and password and click on the arrow to log-in. Next you’ll be at the QTS desktop screen. You need to install the Google Drive Sync App. Go to App Center and click on it. Please ignore the already installed optional apps on my screen including the Google Drive Sync app itself. Once inside App Center, click on All Apps on the Menu bar to the side. 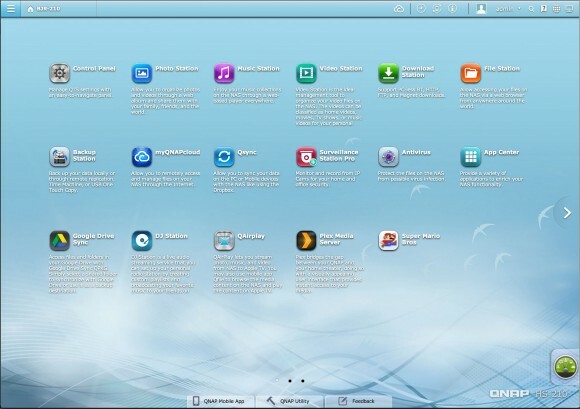 You’ll be presented with a list of all apps available for your QNAP. Scroll down until you see Google Drive Sync. Click where it says Add to QTS +. Now wait while the app is downloaded and installed. When installed, the button will now say Open with a green circle on the right. Click on it. You’ll now be asked to enter your QNAP username and password. Enter them both. Remember, this is your QNAP password, not your Google password. That will come a bit later. Now you’ll see an option for a linked account. Click on the button next to the account window. You’ll be presented with a dialog box to enter your Google account and password. Remember these are for your Google account and not the username and password for the QNAP. Now click on Allow Access. 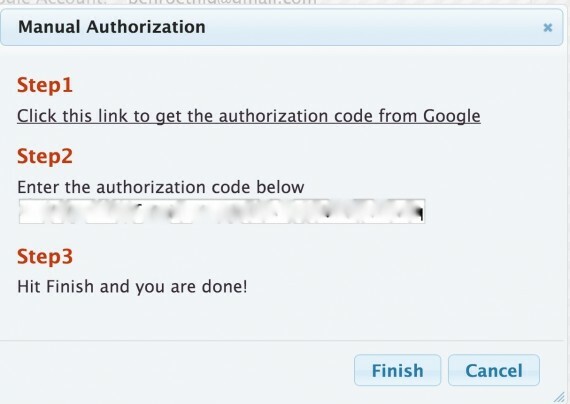 If that does not work, you’ll have to go the manual authorization route. Click on Manual Authorization. You’ll be presented with a new 3-step box. First step is the click on the link. It will bring you to a new window. Where you’ll have to authorize Grive (on which this sync tool is based) to have the account permissions listed above. Once you authorize you’ll be given a code. Copy this code, close, and paste it in the step 2 box. Finally, click Finish. If it’s successful, you can close out the other window. Now that you’ve connected accounts, you’ll be able to set up a sync schedule. First choose a local sync folder on the QNAP. By default it’s the downloads folder. You’ll also be able to create a sub-directory. I named this GoogleDrive for obvious reasons, but you can call it whatever you wish. Next step is choosing a synchronization method. 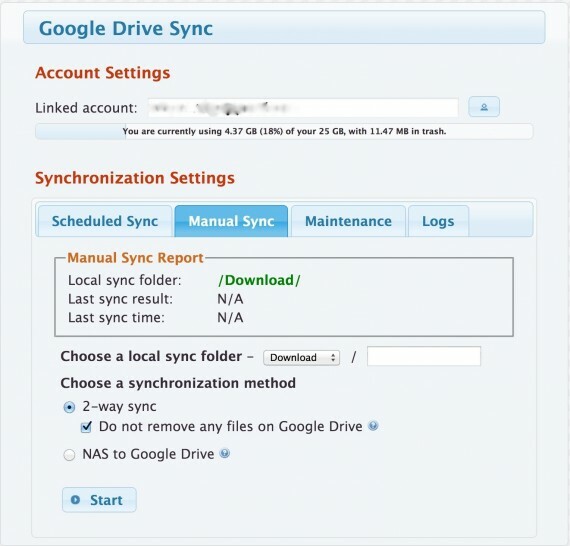 You can choose a 2-way sync between your Google Drive cloud storage and your QNAP or you can choose a 1-way sync where your NAS files are uploaded to your drive account. You can also choose to not let your QNAP delete cloud files in 2-way. Last step is setting up Sync Schedule – this can be hourly, daily, weekly, or monthly. 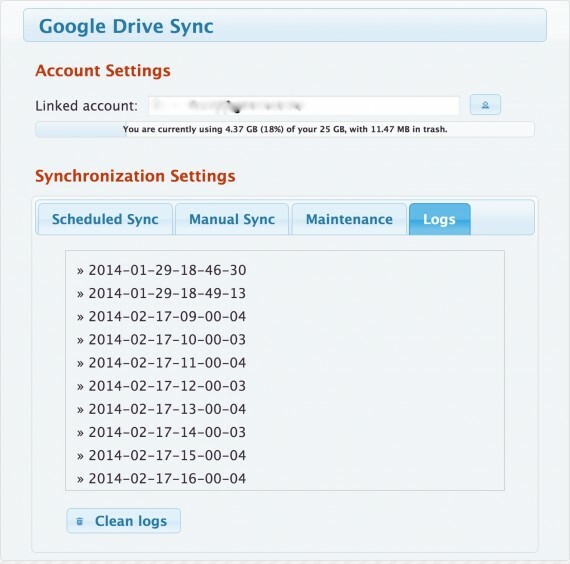 Depending on your option, you can choose the day and time when your Google Drive is synced to your QNAP. Now click Save schedule to finish. You can also remove schedule if you want to change this. Next tab is the manual sync. It works the same way as the scheduled sync, but without the scheduling component. Choose your local sync folder and whether you want 1 or 2-way sync and then press start. You only need to use this if want or need to immediately perform a sync. The maintenance tab is rather limited in its scope. It allows you to empty the local trash directory for your Google Drive account. 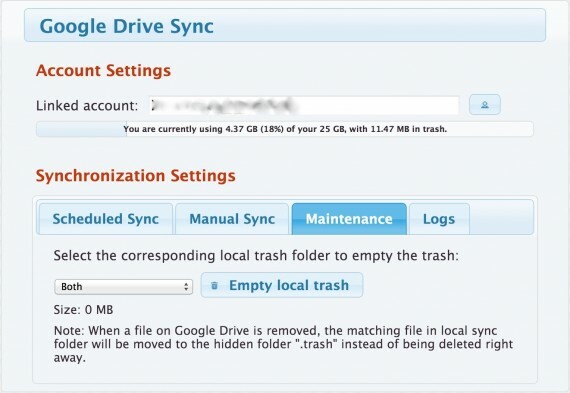 If there is a large cache of files you deleted from your Google Drive, then click on Empty local trash. The last option is the logs tab. You can view past logs or remove them by clicking on Clean Logs. Now you’re done and should be able to use the Google Drive Sync for your QNAP. I hope this helped helped keep your G-Drive data safe. If you want to review more options on what you can do with your QNAP, please stay tuned for more of our sponsored series on how to use your QNAP TurboNAS. Looks like your last scheduled sync was a failure. I’m on 20 out of 60 gigs now. Over the last 3 days, I’ve submitted the sync about a dozen times now. It’s getting there, little by little. They’re all bunch of grive errors, mostly because the files were exported from iPhoto, and grive can’t deal with complex directory structures or weird file names. I’m almost tempted just go out and buy a blu-ray writer, and couple of dual layer disks.